#5......"MAN WITHOUT A PAST" - BODIE 3.7 . you'll never walk alone ! thankyou and you are very welcome ...many thanks also for taking a look . Fantastic angle. I love the way his cheekbones are highlighted and yet his face is half in shadow. Great image, thank you. Yes, that's a pretty rare occurrence in canon. it doesn't happen very often but once he explodes ..pity who gets in his way . and a side of Bodie i really enjoy . i know exactly what you mean ...he doesn't seem to get angry too often , he seems quite unnerved and steadfast but once he does ..explosion time . 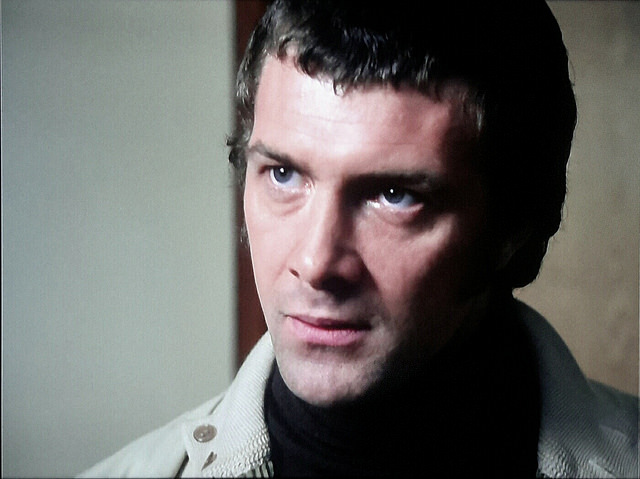 I once read an interview with Lewis in which he said he himself was very much like Bodie in that he was quite a relaxed person but once he lost his temper ..then he could really get angry . That's interesting. Of the two characters, Doyle was definitely the more volatile, but I think the impact of Bodie losing his temper always seemed more extreme because it happened so much less frequently. i just love the different aspects of bodie's character ..angry , deadly , cheeky ...he is just the best . Wow, his eyes are almost violet in this photo! I've been enjoying seeing these - he looks great in this ep, thank you for posting them! i always find his eyes draw you in ..they are such an intense shade of blue. I'm glad you are enjoying these and next week i will switch to another episode etc... thankyou so much for looking and liking and i hope you like the next set that will follow this one . Oh so beautiful. I love the angle of this shot. You can't tear your eyes away!